DC’s dynamic and nationally recognized local food scene wasn’t always on trend. In the beginning of the DC local food movement, from-scratch ingredient-driven food brands had to reinvent a system that was set up for failure. Commercial kitchen space was a coveted pie-in-the-sky dream that required some serious dough (and connections) to secure. Economic development came in the form of business loans that were irrevocably entangled with the strings of “personal guarantee.” Microscopic economy of scale meant low or non-existent profit margins, and lots of working for free on the founders’ part. Getting bigger without losing quality or dumbing down on ingredients — think wholesale, a stall at Union Market, and catering — well, that took finesse. Upstart Mason Dixie Biscuit Company couldn’t afford a business consultant — or a brand strategist, for that matter. But they sure needed one. Winning a contest saved the day. In Strategy Sessions, we trudged through the tough stuff of team development: working through conflict and making strategic decisions. Mason Dixie’s essential “Go vs. No Go Matrix” helped set up parameters for growth and development. This “North Star Approach” guided them through many temptations, that looked good from afar, but were actually far from good. 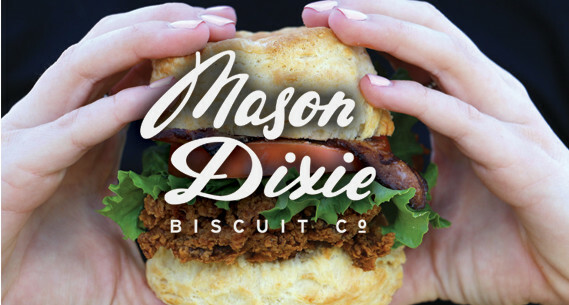 Events were at the heart of the Mason Dixie Biscuit Company’s initial Marketing + Brand Strategy. They needed to be out making friends wherever they went, and not rest too much on the comfort of their uber-successful Kickstarter campaign. Together, we gathered tons of names for the mailing list and handed out thousands of samples. We celebrated each new follower on social media, every partnership opportunity, and every stamp on a customer’s rewards card. Regular reporting in Grows & Glows outlined current problems (and how to overcome them) as well as pointing out victories, both big and small. This roadmap helped keep the leadership team focused and on track.